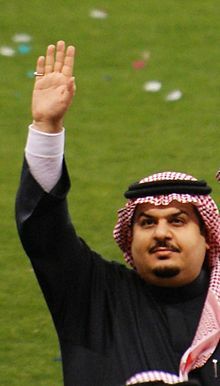 Abdulrahman bin Musa'id bin Abdul Aziz (Arabic: عبدالرحمن بن مساعد بن عبد العزيز آل سعود‎, born 18 August 1967) is a Saudi Arabian-French businessman, writer and the former president of Saudi soccer club Al-Hilal. He is son of late Prince Musa'id bin Abdulaziz Al Saud. He studied at Paris-Sorbonne University and King Saud University. ^ "Eric Gerets Wants To Coach Both Al Hilal And Morocco". Goal.com. 14 December 2009. Archived from the original on 23 December 2009. Retrieved 31 December 2009.